Published reviews on the benefits of horse chestnut seed extract indicate this supplement is a promising way of treating painful varicose veins as well as hemorrhoids. Also, treatment with this supplement is painless and without a lengthy surgical recovery time. Although not clinically claimed, horse chestnut supplementation has also been known to be used for several other conditions like menstrual cramps, diarrhea, pancreatitis, kidney and liver disease, stomach ulcers, etc. While research has been mainly focused on horse chestnut seed and leg vein problems, continued studies are anticipated of other health issues as well. The key conditions claimed to benefit most from horse chestnut are diarrhea, varicose veins, hemorrhoids, and circulatory disorders. 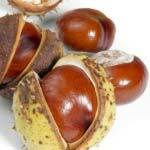 Horse chestnut seed extract is available in a topical form as a horse chestnut cream, gel, or balm. This is beneficial for application on sprains, contusions, or bruises. The extract also comes in an oral supplement as a capsule or tablet form which is often time released. Like many other herbal supplements, horse chestnut seed is also available in a tincture. The popularity of horse chestnut has caused health food stores as well as some grocers to stock it on their shelves. This supplement is said to be safe and effective. Stomach upset is minimal with timed released capsules or pills. It has been warned that this supplement should not be combined with Coumadin.